LIM homeodomain transcription factors, Lmx1a and Lmx1b, are required for the development of midbrain dopaminergic (mDA) neurons. 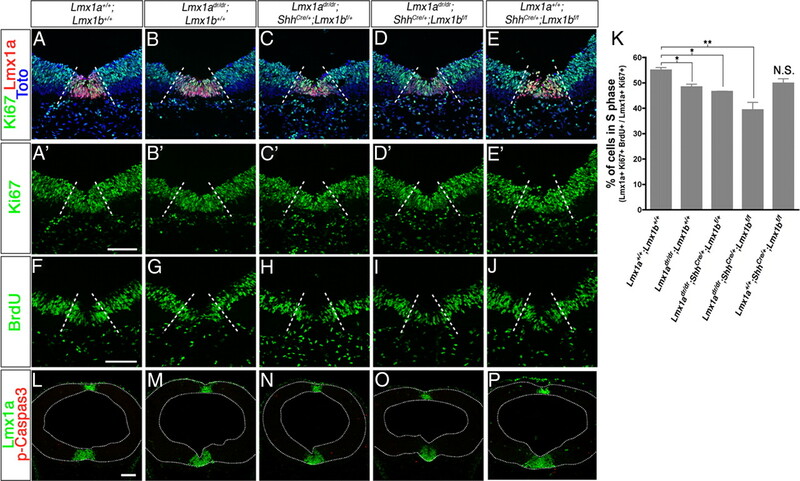 Lmx1b is required for the specification and maintenance of mDA neurons, primarily due to its role in isthmic organizer development that is essential for the induction of mDA neurons. Here, we conditionally deleted Lmx1b in the ventral neural tube using ShhCre and found that Lmx1b conditional mutant mouse embryos show no defect in the development and maintenance of mDA neurons. In addition, Dreher (Lmx1a mutant) embryos display only a moderate reduction in the number of mDA neurons, suggesting that the related family member Lmx1b might compensate for Lmx1a function. We therefore generated Lmx1a and Lmx1b double mutants. Severe loss of mDA neurons occurred in Lmx1adr/dr;ShhCre/+;Lmx1bf/f double mutants due to essential roles for Lmx1a and Lmx1b in regulating the proliferation and neuronal commitment of mDA progenitors through the expression of Wnt1 and Ngn2, respectively. Lmx1a and Lmx1b also negatively regulate Hes1 expression and consequently cell cycle exit through activation of p27Kip1 expression. In addition, Lmx1a and Lmx1b also regulate the expression of floor plate genes such as Corin and Slit2 and specification of postmitotic mDA neurons. These defects were more severe with decreasing gene dosage of Lmx1a and Lmx1b or observed only when all four copies of Lmx1a and Lmx1b genes were inactivated. Together, our results demonstrate that Lmx1a and Lmx1b function cooperatively to regulate proliferation, specification, and differentiation of mDA progenitors, including their floor plate-like properties. Midbrain dopaminergic (mDA) neurons have diverse roles in regulating motor and cognitive functions (Bjorklund and Lindvall, 1984). Degeneration or dysfunctions of these neurons can lead to severe neurological disorders such as Parkinson's disease (Lang and Lozano, 1998; Olanow et al., 2003). These neurons are thought to arise from progenitors in the floor plate region of the caudal diencephalon and the mesencephalon (Marin et al., 2005; Andersson et al., 2006a; Ono et al., 2007). Extrinsic signals, such as sonic hedgehog (Shh), fibroblast growth factor-8 (Fgf8), Wnt1, and transforming growth factor-β2 (Tgf-β2) and Tgfβ3 specify mDA progenitor identity (Hynes et al., 1997; Ye et al., 1998; Farkas et al., 2003; Prakash et al., 2006). Consequently, mDA progenitors are assigned a combined transcription factor code, including expression of Otx2, Foxa1, Foxa2, Lmx1a, and Lmx1b. Otx2 is a homeodomain transcription factor required for patterning the mid-hindbrain region (Puelles et al., 2003) and specification of mDA progenitors (Omodei et al., 2008). Foxa1 and Foxa2 are members of the forkhead/winged helix family of transcription factors required for development and maintenance of mDA neurons in adults (Ferri et al., 2007; Kittappa et al., 2007; Lin et al., 2009). Lmx1a and Lmx1b belong to the Lmx group of LIM homeodomain transcription factors and share 64% homology in their overall amino acid composition (Hobert and Westphal, 2000). Lmx1a spontaneous mutants dreher (Lmx1adr/dr) exhibit a complex phenotype, including circling behavior, sterility, pigmentation, and tail abnormalities (Lyons and Wahlsten, 1988; Chizhikov et al., 2006a). Loss- and gain-of-function studies in chick embryos also demonstrate that Lmx1a is an essential determinant of mDA neuron development (Andersson et al., 2006a). However, only 46% of mDA neurons are lost in Lmx1adr/dr mutant mouse embryos, suggesting that the related family member Lmx1b may compensate for Lmx1a function (Ono et al., 2007). Loss-of-function studies demonstrate that Lmx1b regulates mid-hindbrain patterning, and consequently severe reduction of mDA neuron number is primarily due to early loss of most of the midbrain in Lmx1b−/− mouse embryos (Guo et al., 2007). Lmx1b also failed to rescue the loss of mDA neurons in chick embryos with specific downregulation of Lmx1a in the ventral midbrain using siRNAs (Andersson et al., 2006a), suggesting that Lmx1b cannot compensate for Lmx1a function in the development of these neurons. In contrast, Lmx1a and Lmx1b show similar roles in mDA neuron development in gain-of-function studies in mouse embryos (Lin et al., 2009; Nakatani et al., 2010) and in ES cells (Chung et al., 2009); however, in these experiments, Lmx1b induces Lmx1a expression in mDA cells and a specific role of Lmx1b in mDA neuron development remains unclear. We therefore investigated whether Lmx1a and Lmx1b function cooperatively to regulate mDA neuron development using genetic studies in mice. ShhCre/+;Lmx1bflox/flox embryos (referred to as ShhCre/+;Lmx1bf/f) showed no obvious phenotype in the generation of mDA neurons. In contrast, severe loss of mDA neurons occurred in Lmx1adr/dr;ShhCre/+;Lmx1bf/f double mutants. Together, our results demonstrate cooperative roles for Lmx1a and Lmxb in regulating proliferation, specification, and differentiation of mDA progenitors. Lmx1adr/dr mutant mice (B6C3Fe-a/a-Lmx1adr-J; The Jackson Laboratory), ShhCre/+ (Harfe et al., 2004), and Lmx1b floxed (Lmx1bf/f) mice (Zhao et al., 2006) were genotyped as previously described (Mishima et al., 2009). All the mice were maintained in a mixed background. Conditional Lmx1b mice were generated by intercrossing ShhCre/+ and Lmx1bf/f mouse lines. Timed mating was set up for 3 h between Lmx1adr/+;ShhCre/+;Lmx1bf/+ males and Lmx1adr/+;Lmx1bf/f females for Lmx1a/b double-mutant studies, after which the mice were separated. The embryos were staged as E0 when a vaginal plug was detected. The procedures for whole-mount and section in situ hybridization have been described previously (Conlon and Herrmann, 1993; Schaeren-Wiemers and Gerfin-Moser, 1993). The following mouse antisense RNA probes were used: Arx (Colombo et al., 2004), Dll1 (Bettenhausen et al., 1995), Fgf8 (Crossley and Martin, 1995), Erm (Chotteau-Lelièvre et al., 1997), Lmx1a (Millonig et al., 2000), Lmx1b [320 bp long over exons 4–6 of Lmx1b gene encoding for the HD (Puelles et al., 2003)], Pitx3 (Smidt et al., 1997), Hes1 (Tomita et al., 1996), Shh (Echelard et al., 1993), and Wnt1 (McMahon and Bradley, 1990). Antisense probes for Msx1, Slit2, Corin, and Nato3 were generated from cDNA templates using RT-PCR as described previously (Krawchuk and Kania, 2008). cDNA template was generated from E12.5 ventral midbrain RNA. Primer sequences are available upon request. Immunohistochemistry on brain sections were performed as described previously (Ferri et al., 2007). Primary antibodies used in this study were as follows: rabbit anti-aromatic l-amino acid decarboxylase (AADC) (1:500; Novus Biologicals), rat anti-BrdU (1:20; AbD Serotec), rabbit anti-Cyclin D2 (1:200), rabbit anti-Nurr1 (1:200; Santa Cruz Biotechnology), rabbit anti-Isl-1/2 (K4) (1:500) (Tsuchida et al., 1994), rat anti-Ki67 (1:50; Dako), mouse anti-Ki67 (1:50; BD Biosciences Pharmingen), mouse anti-Lim1/2 (1:20), mouse anti-Nkx6.1 (1:200), mouse anti-Nkx2.2 (1:25; DSHB), rabbit anti-Lmx1a (1:500; kindly provided by M. German, University of California, San Francisco, Diabetes Center, San Francisco, CA), guinea pig anti-Lmx1b (1:2000; generous gift from Drs. T. Mueller and C. Birchmeier, Max Delbruck Center of Molecular Medicine, Berlin, Germany), mouse anti-Mash1 (1:200), mouse anti-Ngn2 (1:20; kindly provided by D. Anderson, California Institute of Technology, Pasadena, CA), mouse anti-p27 (1:200), rabbit anti-Sox2 (1:200), mouse anti-Brn3a (1:5), rabbit anti-vesicular monoamine transporter (VMAT) (1:100), sheep anti-TH (1:200; Millipore), rabbit anti-TH (1:1000; Pel-Freez Biologicals), and rabbit anti-Pitx3 (1:500; Invitrogen). Quantifications of cells were performed from confocal images acquired after immunohistochemistry. For E10.5 embryos, the total number of cells was obtained by counting cells from every fourth sections at 12 μm thickness and multiplying raw counts by 4. For E12.5 embryos, cells from one-half of the sections separated at the ventral midline were counted on every sixth section at 12 μm thickness, and total number of cells of the mDA region was obtained by multiplying raw counts by 12. For E18.5 data, we counted all TH+ neurons from five matching sections of 12 μm (one section every six) from wild-type, Lmx1adr/dr, and Lmx1adr/dr Shhcre/+Lmx1bf/f embryos (n = 3 for each genotype). The rostral-most level corresponds to mouse brain atlas at bregma −2.78 mm (Allen Institute for Brain Science). At this level, part of the posterior hypothalamus and the fasciculus retroflexus are located dorsally and medially to the VTA. The posterior-most section corresponds to bregma −3.08, where the fasciculus retroflexus forms a round bundle of fiber located ventrally to the VTA. The total number of embryos counted was 74 that were harvested from 24 litters. Quantitative data represent mean ± SEM for cell counts of the entire midbrain. Two-tailed Student's t tests or ANOVA were used to determine statistical significance. *p < 0.05; **p < 0.01; ***p < 0.001; N.S., not significant. Pregnant females received intraperitoneal injection of BrdU (100 mg/kg; Sigma-Aldrich) 1 h before embryos being harvested and fixed with 4% paraformaldehyde. Sections were immunostained with rat anti-BrdU in combination with mDA cell marker (anti-Lmx1a or anti-Lmx1b) and/or with anti-Ki67. Twenty-four hours before harvesting embryos, pregnant females received intraperitoneal injection of BrdU (100 mg/kg; Sigma-Aldrich). Sections from E11.5 embryos were then triple stained for Ki67, BrdU, and Lmx1b. The quitting fraction is obtained by dividing the number of BrdU-labeled cells that had left the cell cycle (Ki67−BrdU+Lmx1b+) by the number of BrdU-labeled cells that were still cycling (Ki67+BrdU+Lmx1b+). 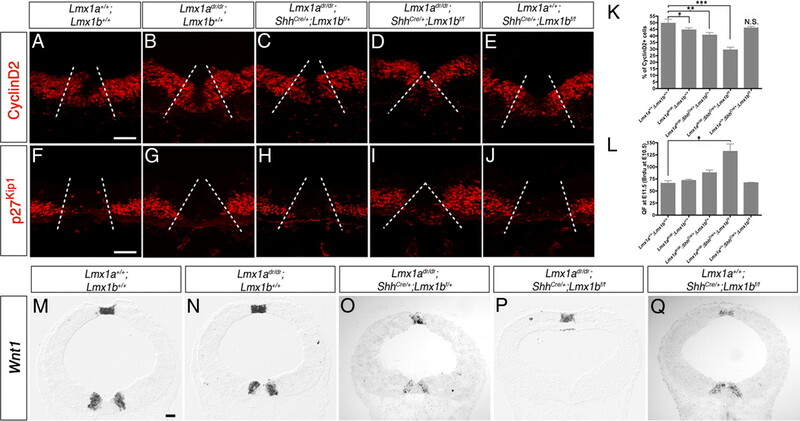 To study the specific effect of Lmx1b on mDA neuron development without disrupting the isthmic organizer, the Lmx1b floxed allele (Zhao et al., 2006) was conditionally inactivated at the ventral midline by ShhCre (Harfe et al., 2004). In contrast to the conventional Lmx1b knock-out (Lmx1b−/−) mice, which die within 24 h of birth (Chen et al., 1998), Lmx1b conditional knock-out (ShhCre/+;Lmx1bf/f) mice were born at the expected Mendelian frequency, were fertile and morphologically indistinguishable from their wild-type littermates, survived to adulthood, and did not show any behavioral defects at least until 18 months of age (data not shown). Cre expressed from the Shh promoter is efficient in deleting Lmx1b in the ventral midbrain at E9.5, E10.5, and E12.5 (Fig. 1A,B,E,F,I,J), in agreement with earlier studies using ShhCre/+ mice to delete other genes in the ventral midbrain (Joksimovic et al., 2009a,b). However, in the caudal-most region of the midbrain, Lmx1b was not deleted in a small number of mDA cells (Fig. 1C,D,G,H,K,L). For this reason, all analyses shown in this paper do not include the caudal-most part of the midbrain and correspond to sections where deletion of Lmx1b is complete. The morphology of the isthmus and the expression of both Fgf8 and Erm, a downstream target of Fgf signaling, appeared normal in ShhCre/+;Lmx1bf/f embryos at E10.5 (Fig. 1M–P), suggesting that Fgf signaling from the isthmic organizer is not disrupted in Lmx1b conditional mutants. Lmx1b is deleted in the majority of the mDA domain before the generation of mDA neurons. A, C, E, G, I, K, Lmx1b transcripts were detected in the ventral midline of wild-type embryos in the midbrain. B, D, F, H, J, L, Lmx1b transcripts were only detected as two lateral stripes in the caudal midbrain and was undetectable in the rostral midbrain of ShhCre/+;Lmx1bf//f embryos at E9.5, E10.5, and E12.5. Fgf signaling from the isthmus organizer is not disrupted in ShhCre/+;Lmx1bf/f embryos as shown by whole-mount in situ hybridization for Fgf8 and for its downstream target Erm at E10.5 (M–P). The arrow in M and N indicates the position of the isthmus. Scale bars, 100 μm. Analyses of TH expression by immunohistochemistry revealed no significant changes in the number of TH+ mDA neurons in ShhCre/+;Lmx1bf/f (123.7 ± 8.6%) and wild-type (100%) embryos at E12.5 (Fig. 2A–C; Student's two-tailed t test, p = 0.11), in contrast to the strong reduction of TH+ mDA neurons in Lmx1b−/− embryos (Smidt et al., 2000). Moreover, there was no difference in the expression of Lmx1a and Lmx1b in mDA progenitors of ShhCre/+;Lmx1bf/f embryos (Fig. 2A,B, D, H, respectively). Importantly, late postmitotic markers Pitx3, AADC, TH, VMAT were still normally expressed in the mature neurons of ShhCre/+;Lmx1bf/f embryos (Fig. 2E–G,I,K). These results indicate that Lmx1b transcriptional activity in the mDA domain is neither required for the development of mDA neurons nor for the expression of mature dopaminergic markers from E9.5 onward. Furthermore, previous studies have shown that TH+ neurons fail to survive beyond E16.0 in Lmx1b−/− embryos (Smidt et al., 2000). In contrast, there was no obvious reduction in the TH+ mDA neurons of ShhCre/+;Lmx1bf/f embryos at E18.5 (data not shown). Therefore, Lmx1b is also not required for the survival of mDA neurons during development from E9.5 onwards. 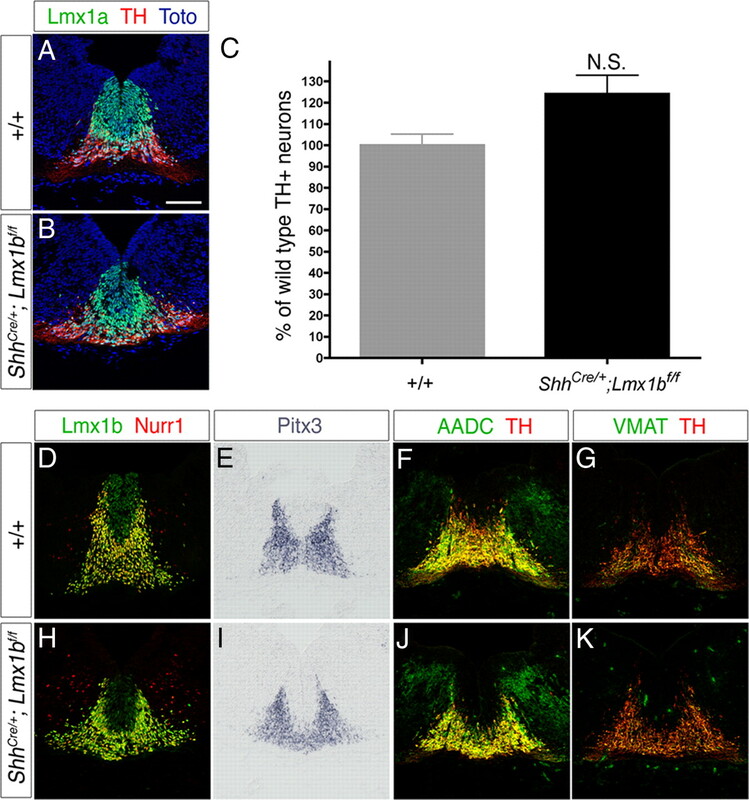 Lmx1b is not required for mDA neuron development. A, B, ShhCre/+;Lmx1bf/f embryos expressed mDA progenitor marker Lmx1a and mature mDA neuronal marker TH. C, There is no statistically significant difference in the number of TH+ cells in the whole ventral midbrain and caudal diencephalon region between wild-type and ShhCre/+;Lmx1bf/f embryos. Error bars indicate SEM. Postmitotic mDA markers Lmx1b, Nurr1 (D, H), Pitx3 (E, I), AADC (F, J), and VMAT (G, K) were all normally expressed in ShhCre/+;Lmx1bf/f embryos. Note that antibodies used to detect Lmx1a and Lmx1b also recognize mutated version of these proteins. Scale bars, 100 μm. Neither the spontaneous Lmx1a mutants dreher (Lmx1adr/dr) nor ShhCre/+;Lmx1bf/f mutants display the severe defects in mDA neuron development observed in siRNA knockdown study of Lmx1a in chick embryos (Andersson et al., 2006a). Furthermore, single mutants of either Lmx1a or Lmx1b continue to express Lmx1b (Ono et al., 2007) and Lmx1a (Fig. 2A,B), respectively. We therefore investigated functional redundancy between Lmx1a and Lmx1b by studying the phenotype of double mutants of Lmx1a and Lmx1b. Double homozygous Lmx1adr/dr;ShhCre/+;Lmx1bf/f mice rarely survived after birth. Only 2 of 206 animals that survived to weaning were homozygous for both Lmx1a and Lmx1b mutant alleles. Mice carrying a single wild-type allele of Lmx1a (Lmx1adr/+;ShhCre/+;Lmx1bf/f) survived to adulthood, did not display any morphological and behavioral defects, and were fertile. Mice carrying a single wild-type allele of Lmx1b (Lmx1adr/dr;ShhCre/+;Lmx1bf/+) showed the classical dreher phenotype of head-tossing, ataxia, circulating behavior, and abdominal white patches of fur (Lyons and Wahlsten, 1988). The development of mDA progenitors (Lmx1a+Ki67+), immature (Nurr1+TH−) and mature (Nurr1+TH+) neurons was then assessed and quantified in the whole midbrain region of Lmx1a/b single and compound mutants at E12.5 (Fig. 3).Both the Lmx1adr and Lmx1bflox alleles generate truncated proteins that are still recognized by the Lmx1a and Lmx1b specific antibodies. However, both alleles are very likely null alleles based on the similar brain phenotypes of homozygous Lmx1adr/dr (Chizhikov et al., 2006b) and Wnt1cre/+;Lmx1bflox/flox (Guo et al., 2007) embryos, when compared with the phenotypes of embryos that are homozygous for Lmx1a-null and Lmx1b-null alleles, respectively. The whole mDA population, including progenitors, immature neurons, and mature neurons, was significantly reduced in Lmx1adr/dr (74.8 ± 1.6%), Lmx1adr/dr;ShhCre/+;Lmx1bf/+ (45.2 ± 1.9%), and Lmx1adr/dr;ShhCre/+;Lmx1bf/f (8.0 ± 0.6%) embryos, when compared with wild-type embryos. There was a proportionate decrease in both mDA progenitors and neurons by reducing the Lmx1b gene dosage on Lmx1adr/dr background (Fig. 3A–K). Confirmation of the decrease numbers of each mDA population was verified by additional markers [i.e., Lmx1b+Sox2+ for progenitors (see Fig. 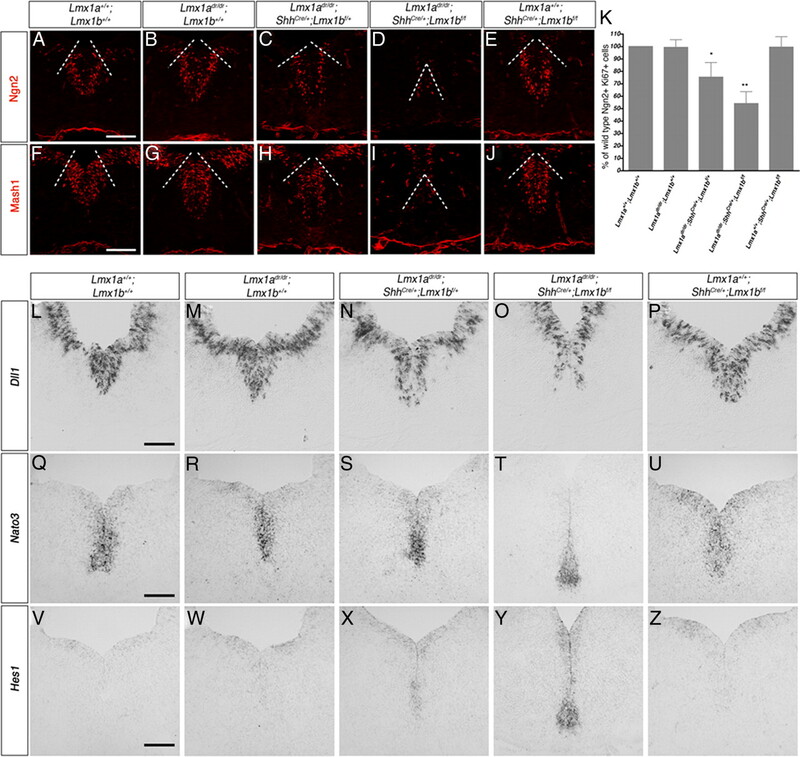 7F–J) and Lmx1b+Sox2− for immature neurons (see Fig. 7F–J) and Pitx3+ (Fig. 3L–P) for mature neurons]. On the contrary, the loss of Lmx1b in ShhCre/+;Lmx1bf/f embryos led to no significant change in the whole mDA population (114.9 ± 4.8%) relative to the numbers present in wild-type embryos. Removing one copy of Lmx1a from ShhCre/+;Lmx1bf/f embryos only resulted in a mild reduction in mDA neuron number (94.4 ± 3.4%). These results indicate that Lmx1a plays a key role in mDA neuron development, and that Lmx1b can partially compensate for the loss of Lmx1a in mDA neuron development. Lmx1a and Lmx1b cooperatively regulate mDA neurons development. A, Quantification of mDA progenitors (B–F, Lmx1a+Ki67+), and immature (G–K, Nurr1+TH−) and mature (G–K, Nurr1+TH+) neurons in the whole midbrain region of Lmx1a/b single and compound mutants at E12.5. The expression of the specific mDA neuron marker Pitx3 is shown in L–P. The dashed line in the schematic embryo indicates where the sections are taken from in the rostrocaudal axis. *p < 0.05; **p < 0.01; ***p < 0.001; N.S., not significant. Error bars indicate SEM. Scale bar, 100 μm. The reduction in the number of mature Nurr1+TH+Pitx3+ mDA neurons in Lmx1adr/dr, Lmx1adr/dr;ShhCre/+;Lmx1bf/+, and Lmx1adr/dr;ShhCre/+;Lmx1bf/f embryos persisted into E18.5 (Fig. 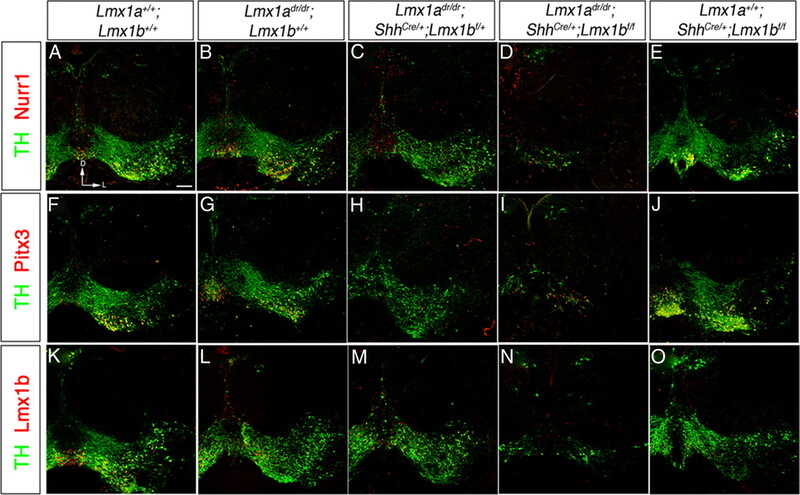 4), demonstrating an essential role for Lmx1a and Lmx1b in the generation of mDA neurons and that the loss of these neurons is not due to a developmental delay. Quantification of the mature mDA neurons (TH+) revealed that Lmx1adr/dr;ShhCre/+;Lmx1bf/f mutant embryos contained only 2.7 ± 0.5% of the number in control embryos. Loss and incomplete differentiation of mDA neurons occurs in the ventral midbrain of Lmx1a/b double homozygous mutant embryos at E18.5. Expression of mature mDA neuron markers TH in combination with Nurr1 (A–E), Pitx3 (F–J), and Lmx1b (K–O) in E18.5 middle midbrain coronal sections from Lmx1a/b single and compound mutants. The few remaining TH+, Nurr1+ (D), TH+, Pitx3+ (I), or TH+, Lmx1b+ (N) mDA neurons in Lmx1a/b double mutants may be generated from caudal progenitors that did not undergo deletion of Lmx1b. Scale bars, 100 μm. D, Dorsal; L, lateral. The mDA progenitor populations were significantly reduced in Lmx1adr/dr, Lmx1adr/dr;ShhCre/+;Lmx1bf/+, and Lmx1adr/dr;ShhCre/+;Lmx1bf/f double mutant embryos to 86.6 ± 1.8, 64.3 ± 3.1, and 14.6 ± 2.6%, respectively, of the wild-type level at E12.5. We determined whether the reduction in mDA progenitor number is due to a proliferation defect or cell death. Short pulse (1 h) BrdU incorporation assays indicated a severe proliferation defect in Lmx1adr/dr;ShhCre/+;Lmx1bf/f mutants at E10.5 (Fig. 5). The mDA progenitors in active cell cycle (Lmx1a+Ki67+) (Fig. 5A–E,A′–E′), and mDA progenitors in S-phase of the cell cycle (Lmx1a+BrdU+) (Fig. 5F–J), were quantified at E10.5 (Fig. 5K). The percentage of cells in S-phase in Lmx1adr/dr (48.4 ± 1.1%), Lmx1adr/dr;ShhCre/+;Lmx1bf/+ (46.6 ± 0.1%), and Lmx1adr/dr;ShhCre/+;Lmx1bf/f double mutants (39.4 ± 2.9%) was statistically different from wild-type embryos (55.0 ± 1%) at E10.5, respectively. In contrast, there was no increase in the levels of apoptosis in any of the Lmx1a/b single and double mutants at both E10.5 and E12.5, demonstrated by phosphorylated-Caspase3 immunohistochemistry (Fig. 5L–P) (data not shown). These results indicate that the reduction in mDA progenitor numbers is a consequence of proliferation defects, but not attributed to apoptosis. Lmx1a/b are required for the proliferation of mDA progenitors in a gene dosage-dependent manner. Proliferation index is measured in Lmx1a/b single and compound mutants by quantification of S-phase progenitors (BrdU+/Ki67+) in the Lmx1a+ domain of whole midbrain and caudal diencephalon at E10.5 (K). A–E, mDA progenitors in active cell cycle expressed both Lmx1a and Ki67. F–J, mDA progenitor cells in S-phase of the cell cycle are double positive for Lmx1a and BrdU. Lmx1a+ region is demarcated by dotted lines. L–P, No change in apoptosis as measured by phosphorylated Caspase 3 staining. The dotted lines indicate the outline of the neural tube. *p < 0.05; **p < 0.01; N.S., not significant. Error bars indicate SEM. Scale bars, 100 μm. To better understand the deficiencies in proliferation, genes involved in the regulation of cell cycle were analyzed (Fig. 6). Cyclin D2, a cell cycle activator protein, was strongly downregulated in the medial region of the mDA progenitor domain of Lmx1adr/dr;ShhCre/+;Lmx1bf/f double mutants (Fig. 6D,K). Quantitative analyses showed that the number of Cyclin D2+ mDA progenitors was significantly decreased in Lmx1adr/dr (Fig. 6B,K), and there was a proportionately further decrease in this number by reducing the Lmx1b gene dosage on Lmx1adr/dr background (Fig. 6C,K). In contrast, there was no significant difference in the number of Cyclin D2+ mDA progenitors in ShhCre/+;Lmx1bf/f embryos (Fig. 6E,K). We also found that the expression of cyclin-dependent kinase inhibitor p27Kip1, which regulates cell cycle exit, was elevated in the medial mDA progenitor domain of Lmx1adr/dr;ShhCre/+;Lmx1bf/f mutants (Fig. 6I) but was normally expressed in all other mutant embryos (Fig. 6F–H,J). We therefore investigated whether the decrease of mDA progenitors could also be contributed by an increased number of mDA progenitors exiting the cell cycle. The quitting fraction (Qf) (i.e., percentage of cycling progenitors quitting the cell cycle within 24 h of BrdU administration at E10.5) was calculated by measuring the fraction of Lmx1b+BrdU+ cells that were KI67−. We found that the Qf was increased only in Lmx1adr/dr;ShhCre/+;Lmx1bf/f mutant embryos (Fig. 6L). These data suggest that the reduced number of mDA progenitors is caused by decrease in cell proliferation and increase in cell cycle exit of these progenitors. Cell cycle progression of mDA progenitors is inhibited in Lmx1a single and Lmx1a/b compound mutants at E10.5. The number of Cyclin D2-positive mDA progenitors is reduced in Lmx1a single and Lmx1a/b compound mutants (A–E, K). The cyclin-dependent kinase inhibitor p27Kip1 is upregulated (F–J) and Wnt1 expression is lost in Lmx1a/b double mutants (M–Q). The graph in K shows the percentage of Cyclin D2+ cells in mDA domain delineated by Lmx1b staining (A–E, dotted lines). Quitting fraction (Qf) in the graph in L is obtained after a BrdU pulse at E10.5 and counting the fraction of BrdU-labeled cells at E11.5 that have exited the cell cycle (Brdu+Ki67−Lmx1b+/BrdU+Ki67+Lmx1b+). *p < 0.05; **p < 0.01; ***p < 0.001; N.S., not significant. Error bars indicate SEM. Scale bars, 100 μm. We next examined the expression of Wnt1 that has been implicated in regulating cell proliferation and differentiation of mDA progenitors (Castelo-Branco et al., 2004; Panhuysen et al., 2004; Tang et al., 2009, 2010). Wnt1 expression was specifically lost in lateral mDA progenitors but not in the roof plate of Lmx1adr/dr;ShhCre/+;Lmx1bf/f mutants, while it is normally expressed in both brain regions of all other mutant and wild-type embryos (Fig. 6M–Q) at E10.5. This result demonstrates that Lmx1a/b specifically and redundantly regulate Wnt1 expression in the lateral mDA domain. Together, our results demonstrate that Lmx1a/b are required cooperatively for the proliferation of mDA progenitors, where Lmx1a plays a more important role during this process. Lmx1a/b likely control the proliferation of mDA progenitors by regulating the expression of Wnt1 and key cell cycle proteins Cyclin D2 and p27Kip1, which in turn control the progression of the cell cycle. We next determined whether specification of mDA progenitors was also affected in Lmx1a and Lmx1b single and double mutants. The expression of Msx1 appeared reduced and lost in mDA progenitors of Lmx1adr/dr;ShhCre/+;Lmx1bf/+ (Fig. 7C) and Lmx1adr/dr;ShhCre/+;Lmx1bf/f embryos (Fig. 7D), respectively, at E12.5, but was not affected in Lmx1a and Lmx1b single mutants when compared with wild-type embryos (Fig. 7A,B,E). Furthermore, the expression of Lmx1b in the mDA progenitors failed to be downregulated in the Lmx1a/b double mutants at E12.5 (Fig. 7F–J). Lack of downregulation of Lmx1b might indicate a delay in these cells; however, this is unlikely to be the case since downregulation of En1 expression in the mDA progenitor region of Lmx1adr/dr;ShhCre/+;Lmx1bf/f double mutants occurred normally as in wild-type embryos between E10.5 and E12.5 (data not shown). In addition, Sox2 expression was still normally expressed in these progenitors in control and all mutant embryos (Fig. 7F–I), confirming the progenitor identity of these cells. Since Lmx1a/b has previously been suggested to inhibit Nkx6.1 expression via Msx1 (Andersson et al., 2006a), we also examined whether Nkx6.1 expression was ectopically expressed in mDA progenitors in the absence of Lmx1a/b. Expression of Nkx6.1 in all mutant embryos was similar to the wild-type pattern (Fig. 7K–O). Together, these results indicate that the reduced population of mDA progenitors in Lmx1a/b double mutants are not fully specified since these cells fail to initiate and downregulate Msx1 and Lmx1b expression, respectively. Lmx1a/b cooperatively regulate mDA progenitor specification. Msx1 expression is reduced and lost in Lmx1adr/dr;ShhCre/+;Lmx1bf/+ and Lmx1adr/dr;ShhCre/+;Lmx1bf/f mDA progenitor, respectively, at E12.5 (A–E). Lmx1b failed to be downregulated in Lmx1adr/dr;ShhCre/+;Lmx1bf/f mutant (I), whereas Sox2 expression appears normal (F–J). Nkx6.1 expression remains unchanged in all mutant embryos (K–O). The dotted lines correspond to mDA domain delimited by Lmx1a. Scale bars, 100 μm. mDA progenitors also express floor plate markers such as Arx (Kitamura et al., 1997), Corin (Ono et al., 2007), and Slit2 (Dugan et al., 2011). While Arx expression was not changed (Fig. 8A–E), Corin (Fig. 8F–J) and Slit2 (Fig. 8K–O) expression were severely reduced in the midbrain of Lmx1adr/dr;ShhCre/+;Lmx1bf/f mutants at E10.5 (data not shown) and at E12.5. Shh expression in floor plate/mDA progenitors is distinctly weaker than in basal progenitors in the ventral midbrain of wild-type embryos at E12.5. In contrast, expression of Shh in the floor plate and basal region appears uniform in Lmx1adr/dr;ShhCre/+;Lmx1bf/f mutant embryos, while expression in other mutant embryos was similar to wild-type embryos (Fig. 8Q–T) at E12.5. Together, these results indicate that Lmx1a/b also has a role in regulating the floor plate properties in mDA progenitors. Lmx1a/b regulate midbrain floor plate identity. Expression of floor plate markers, Arx (A–E), Corin (F–J), Slit2 (K–O), and Shh (P–T) in midbrain coronal sections at E12.5. The arrowheads indicate dorsal position of floor plate in P–T based on the dorsal limit of Arx expression in corresponding A–E. ImageJ software is used to quantify Shh expression between these two regions. Expression ratio is obtained by dividing the mean intensity value from boxed area a by the mean intensity value in boxed area b. Note that Shh expression in S is high in both basal and floor plate progenitors. Scale bar, 100 μm. 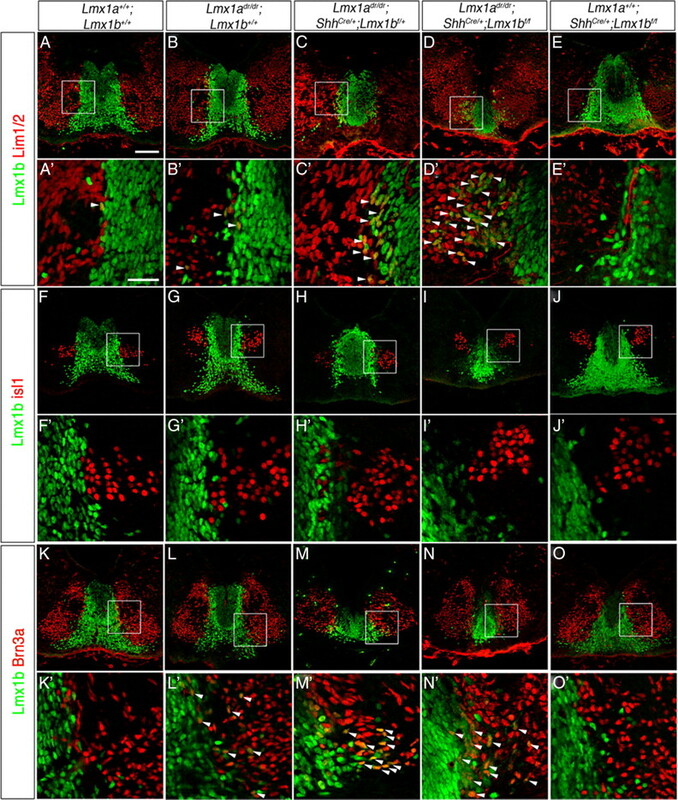 Ngn2 is the major proneural factor required for neurogenesis of mDA progenitors (Andersson et al., 2006a,b; Kele et al., 2006). Lmx1a has previously been shown to regulate neurogenesis by activating Msx1, which in turn induces the bHLH transcription factor Ngn2 in experiments using chick embryos and mouse mutants (Andersson et al., 2006a). Consistent with these data, Ngn2 expression was also reduced in Lmx1adr/dr mouse embryos at E11.5 (Ono et al., 2007). We therefore analyzed the expression of Ngn2 in Lmx1a and/or Lmx1b single and double mutants. Ngn2 expression in mDA region was decreased in Lmx1adr/dr;ShhCre/+;Lmx1bf/+and Lmx1adr/dr;ShhCre+;Lmx1bf/f embryos (Fig. 9A–E) at E12.5. As the number of mDA progenitors was reduced in the mutants, the number of Lmx1a+Ngn2+ cells was normalized to Lmx1a+Ki67+ mDA progenitors to study the specific effect of Lmx1a/b on neurogenesis. The percentage of Lmx1a+Ngn2+ cells was reduced in Lmx1adr/dr;ShhCre/+;Lmx1bf/+ and Lmx1adr/dr;ShhCre/+;Lmx1bf/f embryos, thus confirming neurogenesis defects in these embryos (Fig. 9K). In contrast, there was no significant loss of Ngn2 expression in Lmx1adr/dr after normalization, suggesting that expression of Ngn2 that is reduced in mDA progenitors of Lmx1adr/dr mutant embryos at E11.5 (Ono et al., 2007) is recovered in these embryos by E12.5. To further confirm the defects in neurogenesis, expression of Delta-like 1 (Dll1), which is a direct downstream target of Ngn2, was studied at E12.5. The expression of Dll1 (Fig. 9L–P) was reduced in the same manner as Ngn2 in Lmx1a/b compound mutants. Thus, the neurogenesis defect in Lmx1a/b mutants is correlated to the loss of Ngn2 expression. Lmx1a/b regulate neurogenesis of mDA progenitors. Ngn2 and Mash1 expression are reduced in Lmx1adr/dr;ShhCre/+;Lmx1bf/+ and Lmx1adr/dr;ShhCre/+;Lmx1bf/f mutant embryos at E12.5 (A–K), as well as the expression of Dll1 (L–P), a direct target of Ngn2. Nato3 expression is unchanged (Q–U), but Hes1 is upregulated in Lmx1adr/dr;ShhCre/+;Lmx1bf/+ and Lmx1adr/dr;ShhCre/+;Lmx1bf/f mutant embryos (V–Z). Cell counts in the graph in K are done by calculating the fraction of Ngn2+Ki67+ double-positive cells over the Ki67+ positive cells within the mDA progenitor domain delineated by Lmx1a-stained cells. Data are represented as percentage of wild-type littermate numbers. *p < 0.05; **p < 0.01. Error bars indicate SEM. Scale bars, 100 μm. Another proneural gene Mash1 (Ascl1) can partially compensate for the loss of Ngn2 in the differentiation of mDA neurons, although it is not required for the differentiation of the mDA progenitor cells in the presence of Ngn2 (Kele et al., 2006). The expression of Mash1 was reduced in the same manner as Ngn2 in Lmx1a/b mutants (Fig. 9F–J). Since Mash1 expression in the mDA progenitors is reduced in Ngn2−/− embryos (Kele et al., 2006), it is not possible to dissociate whether this reduction in Mash1 is a direct effect of Lmx1a/b. A third bHLH gene, Nato3 (Ferd3l), also contributes to neurogenic activity of mDA progenitors, in part through repression of Hes1, which negatively regulates Ngn2 expression (Nakatani et al., 2010). We therefore examined the status of Nato3 and Hes1 expression in Lmx1a/b mutants. Interestingly, while expression of Nato3 appears unchanged (Fig. 9Q–U), Hes1 expression was marginally and strongly detected in mDA progenitors of Lmx1adr/dr;ShhCre/+;Lmx1bf/+ (Fig. 9X) and Lmx1adr/dr;ShhCre/+;Lmx1bf/f embryos (Fig. 9Y), respectively. These results indicate that Lmx1a/b repress Hes1 expression, independently of Nato3. Ectopic Hes1 likely leads to the downregulation of Ngn2 expression in mDA progenitors of both Lmx1adr/dr;ShhCre/+;Lmx1bf/+ and Lmx1adr/dr;ShhCre/+;Lmx1bf/f embryos, since repression of Ngn2 expression in mDA progenitors was observed in NestinHes1 transgenic mouse embryos at E12.5 (Ono et al., 2010). Previous studies from phenotypic analyses or Lmx1adr/dr mutant embryos have shown that Lmx1a is also required for the correct differentiation of mDA progenitors by suppressing Lim1/2 expression in postmitotic mDA precursors. We therefore analyzed Lim1/2 expression in Lmx1a and Lmx1b single and double mutants. Lim1/2 (also known as Lhx1/5; Mouse Genome Informatics), which are normally expressed in red nucleus neurons lacking Lmx1b expression, were coexpressed with some Lmx1b+ neurons emerging near the margin of the mDA domain of Lmx1adr/dr mutants as previously described and also within the mDA domain of Lmx1adr/dr;ShhCre/+;Lmx1bf/+ and Lmx1adr/dr;ShhCre/+;Lmx1bf/f embryos (Fig. 10A–E). These Lim1/2+,Lmx1b+ neurons also expressed Lmx1a, confirming that they correspond to postmitotic mDA precursors (data not shown). The number of Lmx1a+ neurons misexpressing Lim1/2 increased with decreasing number of alleles of Lmx1a/b, indicating that Lmx1a and Lmx1b function cooperatively to repress Lim1/2 expression in mDA neurons. We obtained similar results with the red nucleus marker Brn3a, which was also coexpressed by Lmx1b+ cells in the mDA domain margin in Lmx1a single and Lmx1a/b compound mutants (Fig. 10K–O). Together, these data indicate that Lmx1a and Lmx1b also function cooperatively to specify postmitotic mDA precursors. We also found that the expression of Islet1+ in oculomotor neurons was similar among all mutants and wild-type embryos (Fig. 10F–J), indicating that Lmx1a and Lmx1b are not required for the generation of these neurons from E9.5 onwards. Lmx1a/b are required for the specification of postmitotic mDA precursors. Scattered Lmx1b+ neurons misexpressing the red nucleus neuron markers Lim1/2 (A–E, A′–E′) and Brn3a (K–O, K′–O′) are found at the margin of mDA domain in Lmx1a single and Lmx1a/b compound mutant embryos at E12.5. The oculomotor neuron marker Isl-1 does not colocalizes with Lmx1b+ neurons in any Lmx1a/b mutants (F–J, F′–J′). Zones delimited by the white squares correspond to the high magnification in A′–O′. The white arrowheads indicate double-labeled neurons. Scale bars: A, 100 μm; A′, 500 μm. Lmx1b is expressed in the isthmic organizer and mDA progenitors at E9.5. Previous studies have shown that severe reduction of mDA neurons occurs in Lmx1b-null mutant embryos (Smidt et al., 2000). This loss is primarily due to an earlier role of Lmx1b in regulating the expression of Fgf8 and Wnt1 in the isthmic organizer (Guo et al., 2007). In our paper, Lmx1b is specifically inactivated in mDA progenitors and not in the isthmus in ShhCre/+;Lmx1bf/f embryos. Specification and differentiation of mDA progenitors occurred normally in these mutants, indicating that Lmx1b is not required for either of these processes. Lack of a phenotype results from compensation by Lmx1a, since double homozygous Lmx1a/b mutants show almost complete loss of mDA neurons. Lmx1a and Lmx1b double mutants showed a progressively greater loss in the number of mDA progenitors compared with Lmx1a single mutants (Andersson et al., 2006a; Ono et al., 2007), with the further removal of one and two copies of Lmx1b genes. As the percentage of mDA progenitors in S-phase was proportionately decreased in mutant embryos lacking more copies of Lmx1a and Lmx1b genes, Lmx1a and Lmx1b function cooperatively to regulate the number of mDA progenitors. In addition, p27Kip1 expression was increased in mDA progenitors and this was accompanied by an increase in the frequency of progenitors exiting cell cycle in Lmx1adr/dr;ShhCre/+;Lmx1bf/f embryos at E10.5. None of the other Lmx1a/b mutants showed change in p27Kip1 expression and frequency of quitting fraction of progenitors. Together, these results indicate that Lmx1a/b function cooperatively to regulate the proliferation of mDA progenitors and cell cycle exit. Lmx1a and Lmx1b regulate proliferation of mDA progenitors in part through the regulation of Wnt1 that is involved in promoting proliferation of mDA progenitors (Panhuysen et al., 2004). Consistent with this idea, we show that expression of Cyclin D2, a downstream target of Wnt1 and a major cell cycle regulator (Rulifson et al., 2007), is also severely affected in mutants lacking both Lmx1a/b genes. These results are consistent with the observation that Wnt1 and Lmx1a mutually regulate the expression of each other during differentiation of mouse ES cells into mDA neurons (Chung et al., 2009). Lmx1a and Lmx1b also regulate mDA neuronal cell number by controlling the extent of neurogenesis via regulating the expression of Ngn2. This conclusion is supported by the observation that there is a further decrease in the expression of Ngn2 in mDA progenitors by reducing Lmx1b gene copy number in an Lmx1a mutant background. Previous studies have suggested that Lmx1a regulate Ngn2 expression (Ono et al., 2007; Nakatani et al., 2010) indirectly, via Msx1 genes (Andersson et al., 2006a). Consistent with this hypothesis, Msx1 expression was also lost in Lmx1a/b double mutants. Our studies also reveal a novel role for Lmx1a/b in regulating neurogenesis via repression of Hes1, a negative regulator of Ngn2. Ectopic Hes1 expression may also explain induction of p27Kip1 expression in mDA progenitors, as Hes1 has been shown to induce p27Kip1 in the mDA progenitor domain of Nestin:Hes1 transgenic embryos (Ono et al., 2010). In conclusion, Lmx1a/b regulate mDA neuronal cell number by regulating proliferation, cell cycle exit, and differentiation of mDA progenitors. It is noteworthy that the proliferative defect of mDA progenitors in the Lmx1a/b double mutants is similar to that of En1Cre;Otx2flox/flox embryos; however, in the latter mutant embryos, Lmx1a expression is lost while Lmx1b is still expressed in mDA progenitors, and therefore one might have expected a weaker phenotype that is similar to the Lmx1a single-mutant phenotype (Omodei et al., 2008). The severe loss of mDA neurons in En1Cre;Otx2flox/flox embryos suggests that Otx2 regulate proliferation in part through regulation of Lmx1a and also through regulating Wnt1 independently of Lmx1a and Lmx1b since Wnt1 expression is also lost in En1Cre;Otx2flox/flox embryos. Earlier studies demonstrate that Lmx1a is required for the repression of Lim1/2 expression in postmitotic mDA precursors (Ono et al., 2007). Lmx1b cooperates with Lmx1a in repressing Lim1/2 expression since the number of mDA precursors abnormally expressing Lim1/2 is increased in Lmx1a/b double mutants. Repression of Brn3a in some mDA neurons is also regulated by Lmx1a/b. Together, these results indicate that Lmx1a/b function cooperatively to regulate specification of postmitotic mDA precursors by inhibiting the expression of determinants of red nucleus neurons in these cells. Lmx1a/b are required to positively regulate both Corin and Slit2, but not Arx expression in mDA progenitors at E12.5. Furthermore, the level of Shh expression was also altered in the midbrain floor plate region of double mutants. 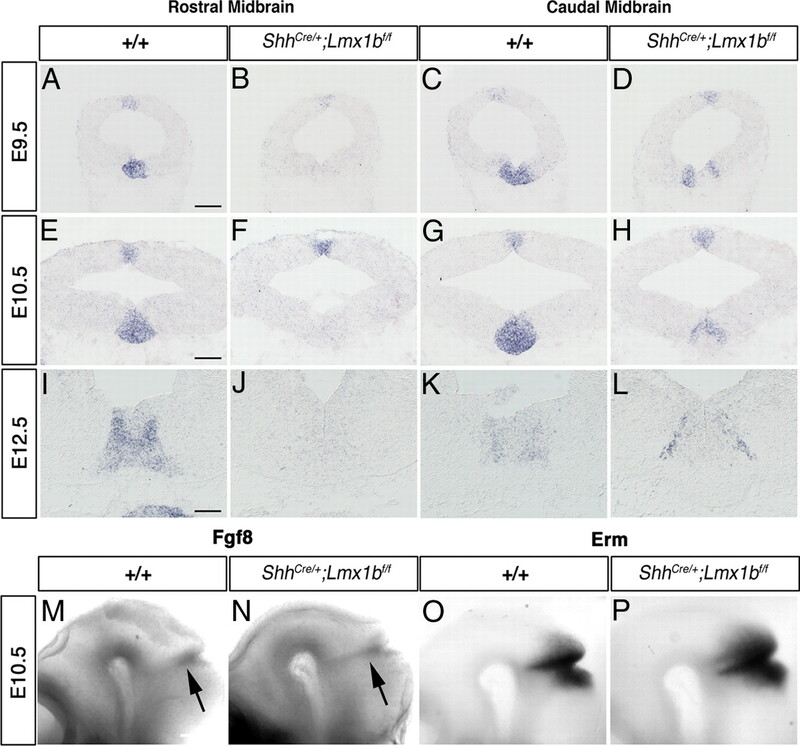 These results therefore indicate that Lmx1a/b are required for floor plate differentiation and are consistent with earlier studies showing that ectopic expression of Lmx1a in transgenic mouse embryos can induce Corin and repress Shh expression in basal midbrain progenitors (Nakatani et al., 2010). Slit2 is an axon guidance molecule that has previously shown to regulate the position of ascending dopaminergic fibers projecting into the forebrain (Bagri et al., 2002, Dugan et al., 2011). Together, these findings indicate that Lmx1a/b may be involved in regulating axon targeting of mDA neurons through regulating the expression of Slit2 in the floor plate. Our data from loss-of-function studies of Lmx1a/b double-mutant mouse embryos demonstrate that these genes function cooperatively to regulate proliferation, specification, and differentiation of mDA progenitors. Interestingly, loss of Lmx1a/b did not lead to transformation of mDA progenitor to a more dorsal midbrain progenitor identity, as has been observed in conditional Foxa1 and Foxa2 double mutants. The remaining mDA progenitors continue to express Lmx1a and Lmx1b nonfunctional transcripts, a floor plate marker Arx, and did not express the basal progenitor determinant Nkx6.1. However, Lmx1a/b regulate Ngn2 expression by activating Msx1 expression, repression of Hes1, and downregulation of Shh, and therefore are required for mDA progenitors to acquire neurogenic potential. Our results also show that Lmx1b is required for the generation of mDA neurons in mammalian embryos in the absence of Lmx1a activity, in contrast to results from loss-of-function studies using gene knockdown approaches in chick embryos. In addition, Lmx1a/b are required for Wnt1 expression and contribute to the regulation of mDA progenitor number in mouse embryos. Lmx1a and Lmx1b also cooperate to regulate the expression of Corin and Slit2 in mDA progenitors. Given the role of Lmx1a/b in regulating proliferation and differentiation of mDA progenitors, the challenge in the future is to understand how Lmx1a/b coordinate these two processes to generate the precise number of functional mature mDA neurons. This work was supported by Medical Research Council United Kingdom and by a research grant from Parkinson's United Kingdom (S.-L.A.). We thank members of the laboratory for critical reading of this manuscript, Drs. T. Perlmann and J. Ericson for sharing data prior to publication, and Dr. B. Harfe for generously providing ShhCre/+ mice. (2006a) Identification of intrinsic determinants of midbrain dopamine neurons. Cell 124:393–405. (2006b) Development of the mesencephalic dopaminergic neuron system is compromised in the absence of neurogenin 2. Development 133:507–516. (1995) Transient and restricted expression during mouse embryogenesis of Dll1, a murine gene closely related to Drosophila Delta. Development 121:2407–2418. (1984) Handbook of chemical neuroanatomy, Dopamine-containing systems in the CNS (Elsevier, Amsterdam). (2004) GSK-3beta inhibition/beta-catenin stabilization in ventral midbrain precursors increases differentiation into dopamine neurons. J Cell Sci 117:5731–5737. (1998) Limb and kidney defects in Lmx1b mutant mice suggest an involvement of LMX1B in human nail patella syndrome. Nat Genet 19:51–55. (2006a) The roof plate regulates cerebellar cell-type specification and proliferation. Development 133:2793–2804. (2006b) Molecular definition of an allelic series of mutations disrupting the mouse Lmx1a (dreher) gene. Mamm Genome 17:1025–1032. (1997) Differential expression patterns of the PEA3 group transcription factors through murine embryonic development. Oncogene 15:937–952. (2009) Wnt1-lmx1a forms a novel autoregulatory loop and controls midbrain dopaminergic differentiation synergistically with the SHH-FoxA2 pathway. Cell Stem Cell 5:646–658. (2004) Mouse orthologue of ARX, a gene mutated in several X-linked forms of mental retardation and epilepsy, is a marker of adult neural stem cells and forebrain GABAergic neurons. Dev Dyn 231:631–639. (1993) Detection of messenger RNA by in situ hybridization to postimplantation embryo whole mounts. Methods Enzymol 225:373–383. (1995) The mouse Fgf8 gene encodes a family of polypeptides and is expressed in regions that direct outgrowth and patterning in the developing embryo. Development 121:439–451. (2011) Midbrain dopaminergic axons are guided longitudinally through the diencephalon by Slit/Robo signals. Mol Cell Neurosci 46:347–356. (1993) Sonic hedgehog, a member of a family of putative signaling molecules, is implicated in the regulation of CNS polarity. Cell 75:1417–1430. (2003) Transforming growth factor-β(s) are essential for the development of midbrain dopaminergic neurons in vitro and in vivo. J Neurosci 23:5178–5186. (2007) Foxa1 and Foxa2 regulate multiple phases of midbrain dopaminergic neuron development in a dosage-dependent manner. Development 134:2761–2769. 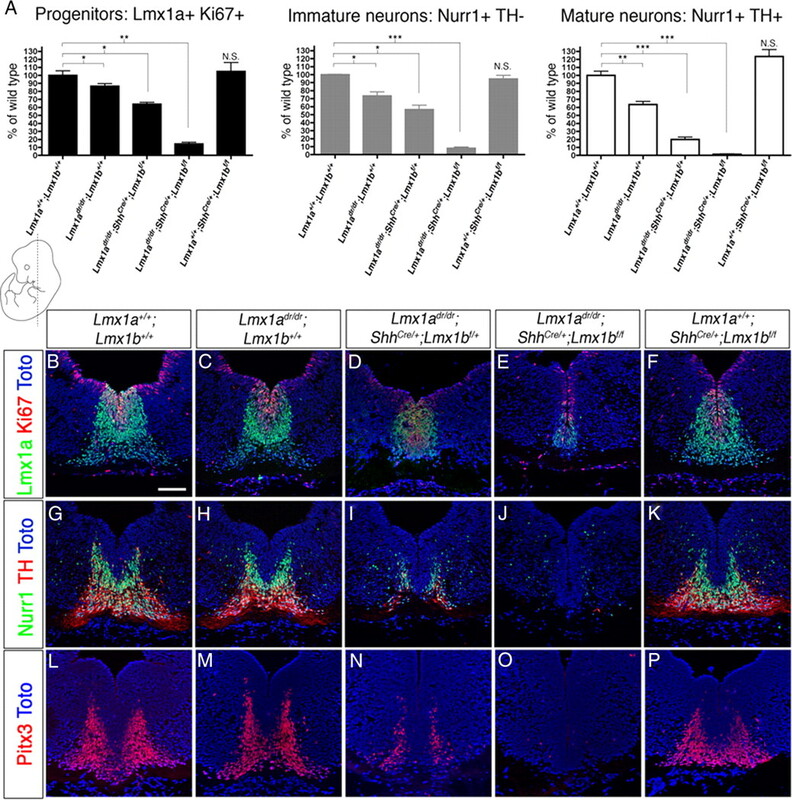 (2007) Lmx1b is essential for Fgf8 and Wnt1 expression in the isthmic organizer during tectum and cerebellum development in mice. Development 134:317–325. (2004) Evidence for an expansion-based temporal Shh gradient in specifying vertebrate digit identities. Cell 118:517–528. (2000) Functions of LIM-homeobox genes. Trends Genet 16:75–83. (1997) Control of cell pattern in the neural tube by the zinc finger transcription factor and oncogene Gli-1. Neuron 19:15–26. (2009a) Wnt antagonism of Shh facilitates midbrain floor plate neurogenesis. Nat Neurosci 12:125–131. (2009b) Spatiotemporally separable Shh domains in the midbrain define distinct dopaminergic progenitor pools. Proc Natl Acad Sci U S A 106:19185–19190. (2006) Neurogenin 2 is required for the development of ventral midbrain dopaminergic neurons. Development 133:495–505. 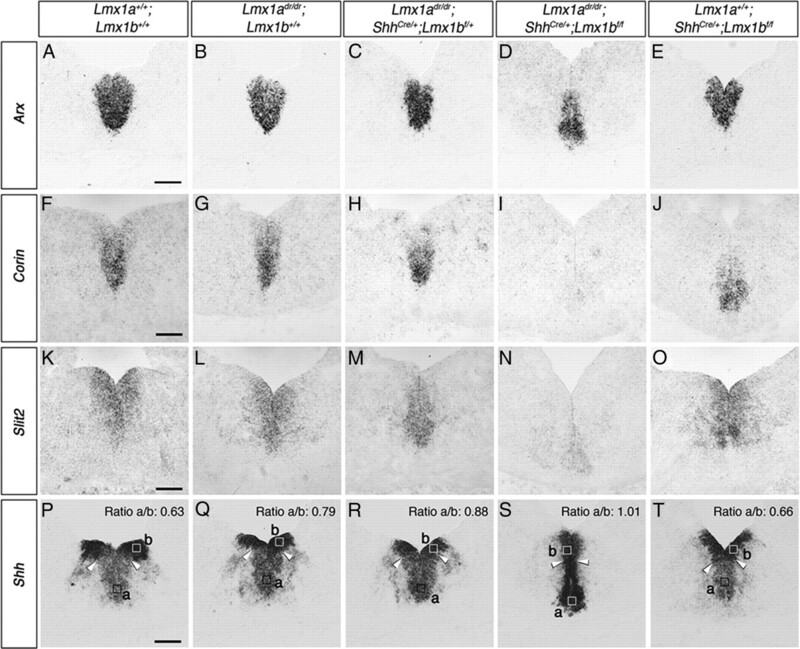 (1997) Expression patterns of Brx1 (Rieg gene), Sonic hedgehog, Nkx2.2, Dlx1 and Arx during zona limitans intrathalamica and embryonic ventral lateral geniculate nuclear formation. Mech Dev 67:83–96. (2007) The foxa2 gene controls the birth and spontaneous degeneration of dopamine neurons in old age. PLoS Biol 5:e325. (2008) Identification of genes controlled by LMX1B in the developing mouse limb bud. Dev Dyn 237:1183–1192. (1998) Parkinson's disease. Second of two parts. N Engl J Med 339:1130–1143. (2009) Foxa1 and Foxa2 function both upstream of and cooperatively with Lmx1a and Lmx1b in a feedforward loop promoting mesodiencephalic dopaminergic neuron development. Dev Biol 333:386–396. (1988) Postnatal development of brain and behavior of shaker short-tail mice. Behav Genet 18:35–53. (2005) Ontogeny of tyrosine hydroxylase mRNA expression in mid- and forebrain: neuromeric pattern and novel positive regions. Dev Dyn 234:709–717. (1990) The Wnt-1 (int-1) proto-oncogene is required for development of a large region of the mouse brain. Cell 62:1073–1085. (2000) The mouse Dreher gene Lmx1a controls formation of the roof plate in the vertebrate CNS. Nature 403:764–769. (2009) Overlapping function of Lmx1a and Lmx1b in anterior hindbrain roof plate formation and cerebellar growth. J Neurosci 29:11377–11384. (2010) Lmx1a and Lmx1b cooperate with Foxa2 to coordinate the specification of dopaminergic neurons and control of floor plate cell differentiation in the developing mesencephalon. Dev Biol 339:101–113. (2003) A double-blind controlled trial of bilateral fetal nigral transplantation in Parkinson's disease. Ann Neurol 54:403–414. (2008) Anterior-posterior graded response to Otx2 controls proliferation and differentiation of dopaminergic progenitors in the ventral mesencephalon. Development 135:3459–3470. (2007) Differences in neurogenic potential in floor plate cells along an anteroposterior location: midbrain dopaminergic neurons originate from mesencephalic floor plate cells. Development 134:3213–3225. (2010) The basic helix-loop-helix transcription factor Nato3 controls neurogenic activity in mesencephalic floor plate cells. Development 137:1897–1906. (2004) Effects of Wnt1 signaling on proliferation in the developing mid-/hindbrain region. Mol Cell Neurosci 26:101–111. (2006) A Wnt1-regulated genetic network controls the identity and fate of midbrain-dopaminergic progenitors in vivo. Development 133:89–98. (2003) Otx dose-dependent integrated control of antero-posterior and dorso-ventral patterning of midbrain. Nat Neurosci 6:453–460. (2007) Wnt signaling regulates pancreatic beta cell proliferation. Proc Natl Acad Sci U S A 104:6247–6252. (1997) A homeodomain gene Ptx3 has highly restricted brain expression in mesencephalic dopaminergic neurons. Proc Natl Acad Sci U S A 94:13305–13310. (2000) A second independent pathway for development of mesencephalic dopaminergic neurons requires Lmx1b. Nat Neurosci 3:337–341. (2009) Multiple roles of beta-catenin in controlling the neurogenic niche for midbrain dopamine neurons. Development 136:2027–2038. (2010) Interactions of Wnt/β-catenin signaling and sonic hedgehog regulate the neurogenesis of ventral midbrain dopamine neurons. J Neurosci 30:9280–9291. (1996) Mammalian hairy and Enhancer of split homolog 1 regulates differentiation of retinal neurons and is essential for eye morphogenesis. Neuron 16:723–734. (1994) Topographic organization of embryonic motor neurons defined by expression of LIM homeobox genes. Cell 79:957–970. (1998) FGF and Shh signals control dopaminergic and serotonergic cell fate in the anterior neural plate. Cell 93:755–766. (2006) Lmx1b is required for maintenance of central serotonergic neurons and mice lacking central serotonergic system exhibit normal locomotor activity. J Neurosci 26:12781–12788.